The trade surplus of China increased to $28.1 billion to $22.8 billion in April. However, the growth rate of exports and imports show a setback. Exports grew 4.9% from a year ago in April, down from an 8.9% pace in March. Exports of China rose nearly 21% in 2011 and moved up 14.3% in the fourth quarter of 2011 on a year-to-year basis. 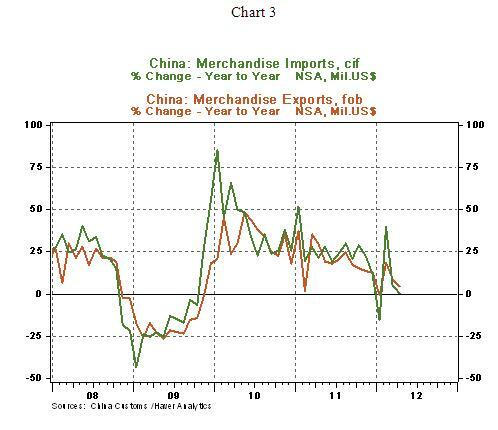 The decelerating trend of exports reflects soft economic conditions among China’s trading partners. Imports of China have screeched to a halt. Imports rose 0.3% from a year ago in April. On a month-to-month basis, imports fell 7.4% in April, which is the third monthly drop in the first four months of the year. Imports posted a nearly 25% increase in 2011. These numbers place expectations of soft landing of the Chinese economy on shaky ground.